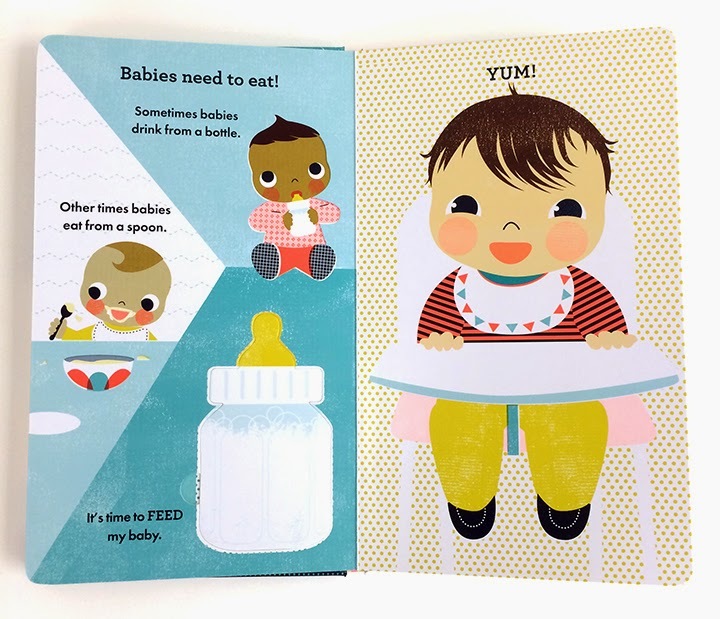 Sara Gillingham is yet another designer and art director who continues to bring her talents to the happily expanding world of quality board books. Her most most recent work as an illustrator and author has been for for abramsappleseed, an newer imprint dedicated to engaging children and adults with "artful, beautifully conceived books." 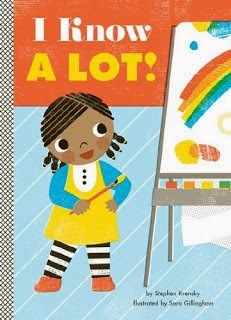 As the Design Director for Children's Publishing at Chronicle Books, an early leader in bringing quality board books to the shelves, Gillingham she designed and art directed hundreds of books, including a few of her own you can see below. 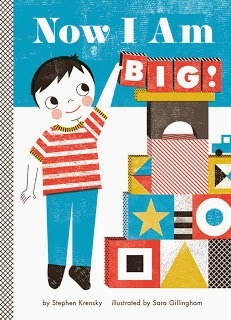 For abramsappleseed, Gillingham illustrated a wonderful trio of board books by Stephen Krensky celebrating the momentous milestones in the lives of toddlers, I Know A Lot, Now I Am Big! and I Can Do It Myself! 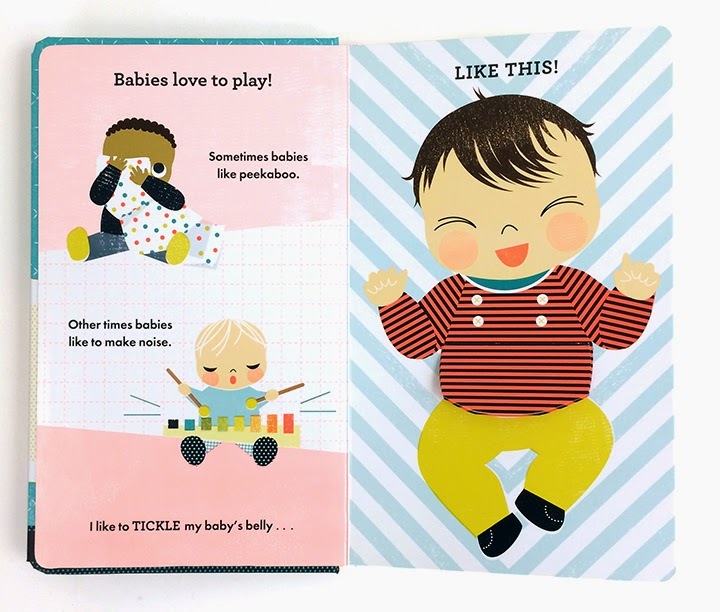 Besides being invited to take care of the baby in the book, readers are encouraged to do what the babies in Snuggle the Baby are doing as well. The book begins, "Babies love to play! Sometimes babies like peekaboo. Other times babies like to make noise." Next the narrator says, "I like to TICKLE my baby's belly . . . LIKE THIS!" 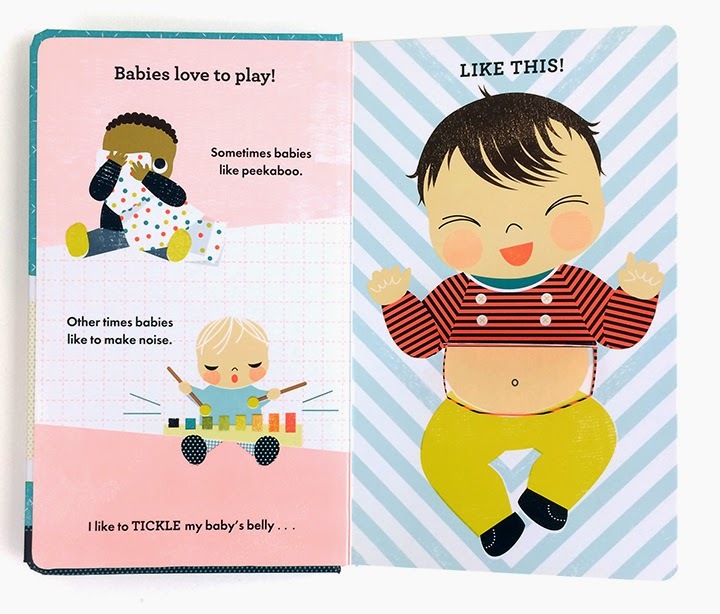 And, as seen in the illustrations above, readers can lift up the baby's shirt and tickle away, most likely while getting tickled by the person they are reading the book with at the same time! Another page lets readers lift the baby's arms and play, "SO BIG!" "Babies need to eat!" another page tells us. 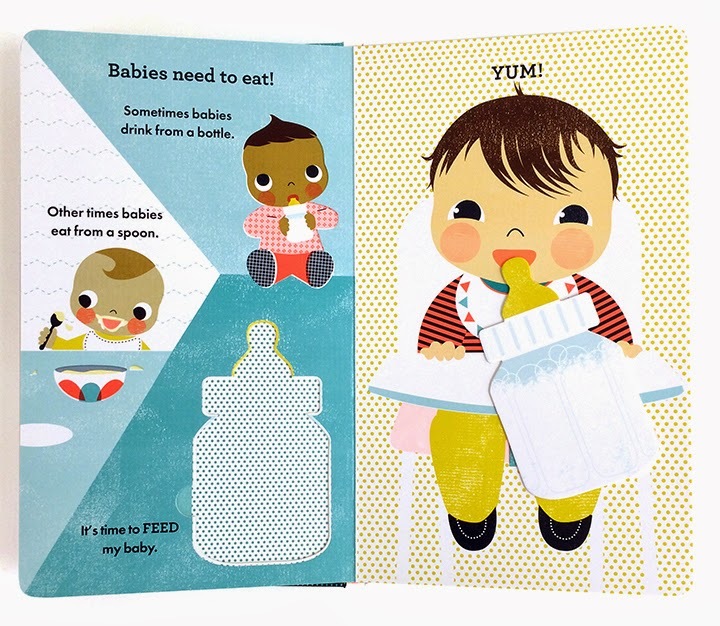 Readers can pop the bottle out of the page and feed the baby! Next comes a diaper change, with a diaper to close and a onesie to "snap" shut. And, as well all know, babies can get cranky. 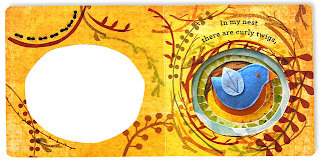 The penultimate page of Snuggle the Baby lets readers fold baby up in a cozy blanket. The swaddled baby is also a pop-out, like the bottle, and, when removed, can be snuggled and rocked then tucked into bed on the last page, a cloth blanket and a velcro closure holding the baby in place snugly. I realize that I probably didn't have to give you a step-by-step description of Snuggle the Baby, but this book is so completely adorable and fun, every time I open it I get sucked in. I wish Snuggle the Baby had been around when my babies were little! Sarah Gillingham's other interactive board books are tipped a bit in favor of visual over narrative, but they are so beautifully illustrated, cleverly conceived and fun that I had to mention them here. This looks really cute! 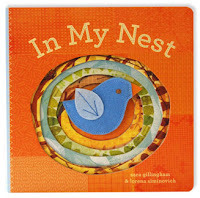 My kids have two interactive cloth books like you describe and as much as they love them, the little ones can't get the bear or baby into the various pockets by themselves.